Leaving Cape Nome the road passes through the coastal grasslands, dunes, and meadows of a long and narrow barrier island environment. 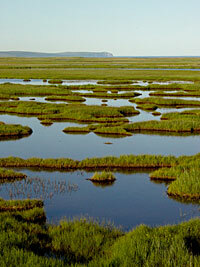 This sandy strip of land divides the protected wetlands and lagoon of Safety Sound from the unprotected marine waters of Norton Sound and the Bering Sea. The close proximity of these waters makes this one of the most dynamic and interesting places for birdlife on the road system. Huge numbers of diverse species arrive at different times to breed and nest, feed throughout the summer, and regroup before migrating south in the fall. The area was named one of the ‘Important Bird Areas” of North America by the national conservation organization, Audubon. In May and early June, melt water appears at the mouth of rivers entering the lagoon and shore zones. The early open water and mudflats are critical arrival and feeding sites for large numbers of spring migrant loons, waterfowl, shorebirds, and gulls returning to the area to breed. Most nesting is underway by mid-June and the season quickly gives way to a brief but near continuous summer feast. Birds capitalize on an explosion of insects, plants, and schools of migrating capelin, smelt, herring, and salmon. Brant and common eiders in large numbers build their down-lined nests on salt grass meadows and islands within protected lagoon waters and later the females may be seen with their young. Other eiders, king, spectacled, and Steller’s, are often associated with large rafts of birds using marine waters in the early spring season. Tundra swan, Canada goose, snow goose, and sandhill crane arrive in large numbers, with some remaining near the road for the entire summer. Northern pintail, greater scaup, American wigeon, long-tailed duck, red-breasted mergansers, and green-winged teal use lagoon waters, and often cluster at locations adjacent to the road. Specialty species like gadwall, Eurasian wigeon, ring-necked, or tufted duck are sometimes found by experienced eyes. Loons are particularly prevalent and this the best place to find all five North American species: red-throated, Arctic, Pacific, common, and yellow-billed. Shorebirds are represented by vast numbers of western sandpiper nesting in meadow habitat and along the lagoon beaches you can find semiplamated sandpiper, red-necked stint, dunlin, and long-billed dowitcher. Nearby, you’ll find Black turnstone associated with areas at the west end of Safety Sound. In some years Eurasian species like lesser sand-plover and ruff make appearances in this area. 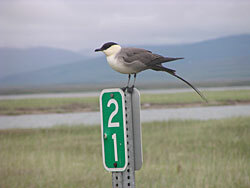 Arctic tern are widely abundant and Aleutian tern may be found in small colonies at variable locations. Large numbers of glaucous and mew gulls are interspersed with smaller numbers of Sabine’s, glaucous-winged, herring or vega, and slaty-backed gulls. Lapland longspur and Savannah sparrow are abundant nesting species among the taller grasses. Peregrine falcons hunt small songbirds and shorebirds. Long-tail jaegers and parasitic jaegers feed on songbirds, shorebirds, and their eggs. Broad vistas make it possible to spot moose or groups of muskox at great distances as they forage or traverse the flat meadows. Arctic fox venture into this area to feed on birds, eggs, and voles and to scavenge on dead marine mammals that wash ashore. Arctic ground squirrel dig burrows easy in the sandy soils, often choosing a spot by a large piece of driftwood. In August and September, huge flocks of migrating waterfowl and shorebirds gather at Safety Sound prior to departing south. Gyrfalcon, hunting small and medium sized birds, are drawn to the area. The coastal forelands serve as a flyway for migrant sandhill crane and groups numbering in the thousands are seen and heard overhead in loud, loose V formations. It’s legal to hunt cranes in Alaska, and they are considered a local delicacy in Nome, sometimes showing up on the dinner table in place of a Thanksgiving turkey. The lagoon waters become increasingly salty as the fresh water begins to freeze, creating new feeding areas for some marine fish. Saffron cod (locally called tomcod) escape predatory seals by entering the lagoon and seeking shelter under the ice. Seals can’t follow because the ice is too thick for them to break a hole through to breathe. Residents, however, chip holes in the ice and jig with colorfully decorated hooks to catch tomcod for freezing, drying, or baking. Inupiat have long occupied sites along the barrier beach where they fished for salmon and tomcods, hunted seals and waterfowl, and gathered greens and berries. On the inland side of the road, the long barrier beach is marked by many shallow vegetated depressions in the soil, ancient “house pit” sites approximately 8 to 10 feet across. At one time, these now weatherworn remains of Inupiat summer camps were framed over with driftwood and covered with walrus skins. Residents of the village of Ayasayuk on Cape Nome used them, so did travelers from other winter villages seeking summer’s abundance of waterfowl, eggs, fish, greens, and berries. The numerous contemporary camps in this area called Nuuk are testimony to the unbroken tradition of subsistence hunting, fishing, and gathering. Seals may be seen in spring, basking on the shore-fast ice or popping their heads out of the water in summer. The camps and associated structures provide nesting sites for tree swallow, American robin, and common raven and dunes in the area offer denning sites for Arctic ground squirrel and red fox. The cabins are privately owned, so please don’t trespass. 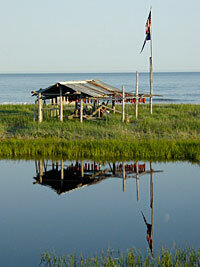 Rounding Cape Nome, the Cape Nome Roadhouse is on the shore-side of the road. Built about every twenty miles along hundreds of miles of trails across Alaska, roadhouses once welcomed winter travelers who would arrive by dog team or horse-drawn sleigh seeking shelter and food. The Cape Nome Roadhouse also saw use as an orphanage after the devastating epidemics of the early 1900s and was a communications base during World War II. It is now a privately owned camp. The Safety Sound roadhouse is open in summer offering travelers shelter from the rain or a cool beverage to wash down the dust. It is closed in winter but opens for several weeks in March to serve as the final checkpoint on the Iditarod Trail. The Safety Bridge is a good vantage point to watch changing tides and the movement of large and small fishes and their predators. Scan for the bobbing heads of seals attracted by the summer fish runs. They are most likely young spotted seals, which remain in coastal waters for the summer rather than follow the ice edge north. Salmon enter through the channel during certain light, tide, and wind conditions. Birds feed on escaping salmon smolt or arriving capelin or herring, including large numbers of eiders, scoters, gulls, kittiwakes, and terns. Look for herring eggs near the lagoon entrance among the mounds of eel grass that wash-up along the beach in spring. On the lagoon side, shorebirds and gulls collect on the extensive mud flats at low tide. Take time to search for rare species that mix with the large numbers of common species. Safety Lagoon slowly narrows and mixes with wetlands, ponds, and the Bonanza River estuary. Thousands of tundra swans move through this area on their spring migration. Breeding swans move on to upland ponds to nest and raise their young, while non-breeding birds may remain here all summer. In the fall, parts of the lagoon and Solomon River wetlands turn white with huge groups of swans preparing for their fall migration south. In the fall, people fish from the bridge for tomcod. Deep water ducks feed in the channel depths of the Bonanza River. Sandhill crane feed on berries, plant shoots, roots, insects, and even small rodents. Red-throated loon and, less commonly, Pacific loon float the waters. Northern pintail, the most abundant waterfowl on the Seward Peninsula, and second-ranked long-tailed duck are primary species in the area near the bridge. Also, look for good numbers of shorebirds (red-necked phalarope, red phalarope, western sandpiper, least sandpiper, rock sandpiper, dunlin, and long-bill dowitcher) among the small ponds just north of the bridge. Scaup and scoters may be seen from the bridge. Northern pintails, long-tailed duck, American wigeon, green-winged teal, northern shoveler are common species. Red-necked phalaropes, western sandpipers, dunlin, and least sandpipers populate the wetlands. 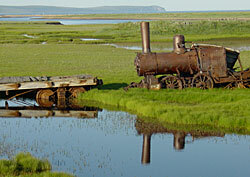 Just across Solomon Bridge, the “Last Train to Nowhere” lies sinking into the tundra. Three rusty steam locomotives and some rolling stock are all that remain of what was to have been the most extensive and prosperous rail system on the Seward Peninsula. In the early 1900s, Chicago investors decided a railroad line should link the region’s major mining centers, and construction of the Council City & Solomon River Railroad was soon underway. But as the gold rush faded, the project became mired in debt and, after five years of construction, the line extended only 35 miles. The project was abandoned in 1907 and the locomotives left to deteriorate. Today, the popular attraction is equipped with viewing platforms and interpretive signs.